Just as the summer moviegoing season kicks into full gear with Captain America: Civil War in theaters May 6, a decidedly different kind of Marvel hero will be joining in on the fun. Yes, the Merc with the Mouth is finally coming home! Ryan Reynolds announced the news on Twitter this morning. 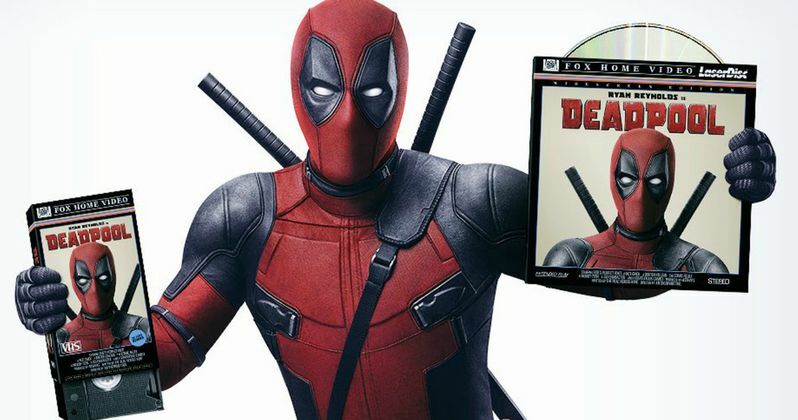 Deadpool will finally be available on Blu-ray and DVD starting May 10th. You can already pre-order your very own copy to snuggle with right here. This is what Ryan Reynolds had to say, warning that some nostalgia enthusiasts who've been around since Wade Wilson's inception might be disappointed while throwing in a classic sexual innuendo. "I'm coming... on Blu-ray MAY 10. Also, non-existent special edition VHS and LaserDisc, 19 years ago." This past weekend, Deadpool finally reached a big milestone. It is now officially the highest grossing R-Rated movie of all time. This comes after the Marvel and 20th Century Fox adventure has been in theaters for 7 weeks. Released in 2003, The Matrix Reloaded held onto the highest grossing R-rated record for a surprising 13 years. It stood firm with its worldwide take of $742 million. But Deadpool stuck another impressive weekend run under its belt, taking in an additional $5 million at the domestic box office. This pushes its global tally to $745 million. It enters its 8th big weekend at the box office, and is sure to take in even more money. Right now, the Blu-ray/Digital HD version retails for $22.99, with the DVD being sold for $19.99. None of the special features have been announced, but we can expect to see a gag reel and some deleted scenes. And this release may do a line-o-rama style featurette, as we know a lot of dirty dialogue got cut for being way too raunchy, even for an R Rated movie. We'll probably get all of the viral videos that have been released over the past two years as well. But this is all speculative at this point. Maybe we'll even get a sneak peek at Deadpool 2? 20th Century Fox green lit Deadpool 2 before Deadpool even opened to such stellar box office numbers. The sequel will introduce fan-favorite mutant Cable and will likely set up the impending X-Men spinoff X-Force. It's also rumored that X-Force member Domino will arrive as Cable's love interest. The entire creative team is expected to come back, with Rhett Reese and Paul Wernick already writing the screenplay. Tim Miller is expected to continue his role as director, and Ryan Reynolds will definitely be back as the Merc with the Mouth. Based upon Marvel Comics' most unconventional anti-hero, Deadpool tells the origin story of former Special Forces operative turned mercenary Wade Wilson, who after being subjected to a rogue experiment that leaves him with accelerated healing powers, adopts the alter ego Deadpool. Armed with his new abilities and a dark, twisted sense of humor, Deadpool hunts down the man who nearly destroyed his life. Take a look at some early Blu-ray cover art as we await the home arrival of this exciting blockbuster phenomenon.